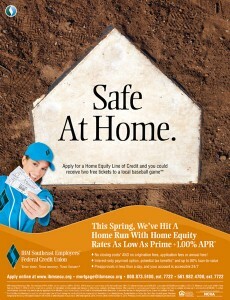 Every Spring, IBM Southeast Employees’ Credit Union steps up to the plate with rewarding incentives for all of their financial services. At MDG, we stay on the ball by developing creative credit union marketing concepts that play off their promotions with a play on the season. And when we think of Spring, we think of baseball. So for their Home Equity Line of Credit promotion, our team ran with the “home” concept to develop a “Safe at Home” poster, flyer and insert. To further drive home the idea, a special offer gives the first 50 applicants the chance to receive two baseball tickets to a local baseball game. Michael Del Gigante is president and executive creative director of MDG Advertising in Boca Raton, Florida. MDG Advertising is a full-service South Florida advertising agency, with offices in Florida and New York, that specializes in developing targeted internet solutions, exceptional creative executions, and solid branding and media buying strategies that give clients a real competitive advantage. For more information, contact MDG Advertising.